My route to Las Vegas took me from London to Los Angeles on a British Airways A380 (review in a couple of days). From LA, I booked myself onto Virgin America for the short hop to Las Vegas. If you want to get a flavour for the airline, take a look at their safety video which I highlighted on Saturday. It tells you all you need to know! They have, I think, succeeded. It didn’t start incredibly well to be honest. Having whizzed through immigration in record time, I found myself with a rather long gap before my Vegas flight. The Virgin America website makes big claims for their lounge, The Loft. In truth, it is pretty pathetic. The view over the apron and runway is impressive (photo below) but there are no facilities to speak of and the food offering is poor. There is a functional bar. In no way does it justify the $40 cost of a day pass. They would not even let me in with my First Class ticket (only refundable First Class tickets are accepted). Luckily I had my Priority Pass with me and used that to enter. After two hours of thumb twiddling, I boarded. 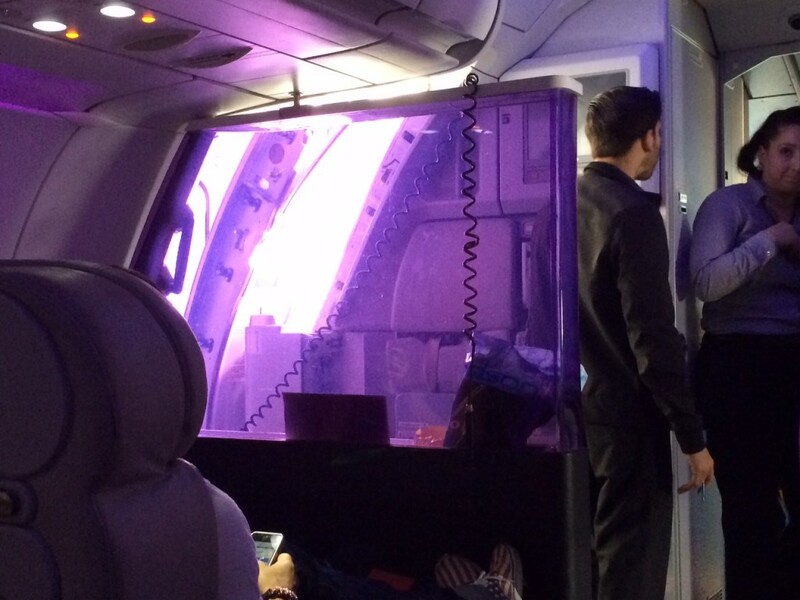 If you have flown Virgin Little Red you will have seen the mood lighting used in the cabin. British Airways is doing something similar with its refurbished short-haul planes although I have yet to see it in action. 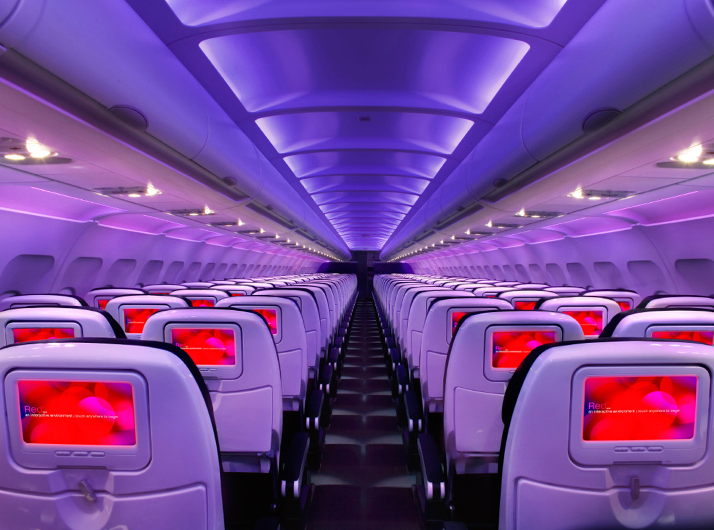 Virgin America does something similar but with some added pizzazz. Take a look at this photograph of mine – the bulkhead is a single piece of clear purple Perspex! 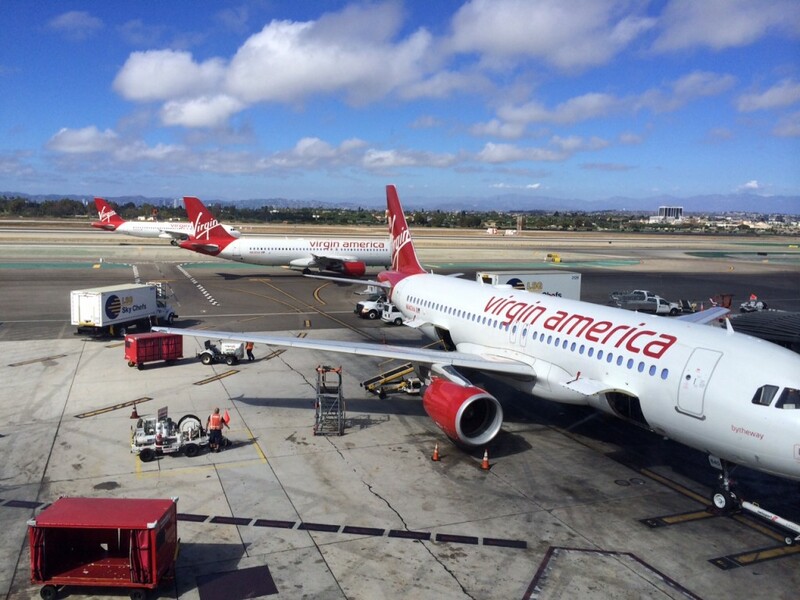 Even in economy, Virgin America knocks other US and European carriers out. Each seat has a built-in TV. There is wi-fi (not free, but cheap – $3 for 30 minutes). Seat pitch is 32 inches – substantially more than British Airways is now offering with its refurbished seats. You can order food and drink via the TV, paying directly with a credit card via the screen. Then we come to First Class, where I was sitting. I will discuss that tomorrow. American Express Gold Business charge card reviewed - is it worth a look? That is disappointing! – I really should have looked into this before booking first class SFO-LAS-LAX. My fault, I just assumed a First Class ticket would include the lounge access, maybe I was just taken in by the awesome looking sofa seats! Looking forward to the flight review. Not sure if it’s still possible, but when we flew VX a couple of years ago, it was possible to login to the website 24hrs and I think 6hrs before departure to check for discounted upgrades. We got from Main Class to Main Class Select for a reasonable charge. MCS comes with the much comfier legroom shown above and free snacks. Still possible. I had that option on a recent SFO-LAS flight. Although I’d generally agree with people pointing out superlatives in this case I think substantial is fair. It’s 3.2% more and given the way leg lengths work the majority of people who find 31″ uncomfortable will likely find 32″ a very welcome improvement. It’s a bit like the difference between a roof being 6′ 5″ or 6′ 4″ for me: At 6′ 4″ I can’t stand up completely straight, at 6′ 5″ I can. My thoughts exactly. It’s all in the last inch! That may be the one you really need. It might be only 3.2% but it can be 100% more wriggle room! Isn’t it less than that in the aft half of the aircraft? BA’s new shorthaul seats have 30″ pitch even in CE. 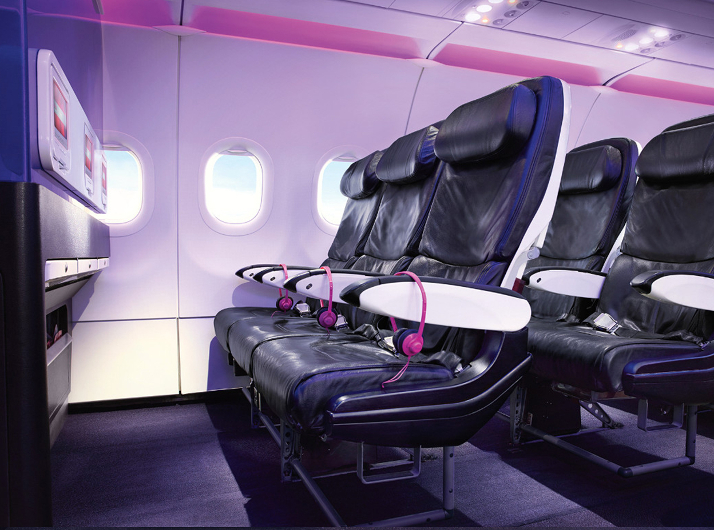 Some A319 seats will have 29″ pitch. Good to hear wifi is cheap on board. I hope other airliners will follow suit. Few wil pay $30 per hour. How is the quality of the connection!? I flew JFK to LAX last year with them (economy) and agree they knock other US airlines out of the park. But as a regular Virgin Atlantic passenger I found the fact that not just food and drinks were chargeable but movies too (TV is free) put them closer to the Ryanair bracket. Lots of style and better than their rivals but a poor relation to European short-haul non-budget carriers. Quite a negative impact on the Virgin brand equity I’m sorry to say. I agree that taking them JFK to LAX is a different proposition to a short hop around California. However, if you compare JFK to LAX to, say, a BA service to Istanbul the I would still prefer the Virgin service. You get the TV (BA doesn’t give you a personal TV to Istanbul) and on a 4 hour flight in Economy I would arguably prefer to pay for food I want than risk starving to death with BA’s free economy catering. And, of course, you would have more leg room than on BA which really comes into its own on a longer flight. If you book at the last minute with Virgin America I’ve found that 1st class seats can sometimes be had for less than the cost of economy seats. The hard product is certainly impressive (I’ve only flown them economy LAX-SFO, so a short hop) but the persistent question since their launch a few years’ back has been profitability and whether they have a deep enough network to attract premium-fare travellers. I hope they have longevity (if only to challenge the dominance of the remaining 3 US airline groups – AA/DL/UA) and they may be able to maintain their boutique niche at acceptable levels of return, but it’s not clear how sustainable their model really is. I think that for anything longer than a couple of hours, you need to go for Main Cabin Select (if you don’t want to fork out for First Class) – the extra leg-room and free snacks that can be ordered at any time during the flight, plus the free films, make it well worth the added expense, which isn’t that excessive. It is certainly far superior to AA First (domestic), which is, frankly, pathetic. AA 1st may not be great (I definitely prefer VX 1st by a long way) but I’d pick AA 1st over BA CE any day. Was this flight booked on virgin miles ? No, good old cash. You can only use Virgin Atlantic miles when booking a return flight (as with all Virgin partners) and I only needed a one-way. Did you try the centurion lounge ? Schoolboy error on my part. It turns out that it is in the other terminal to the one BA use. I was stuck in “The Club at LAS” for two hours which I would not want to force on anyone! This looks a very similar experience to Virgin Australia. Modern planes with similar funky lighting and fit-out. Their Coast-to-Coast service (SYD / MEL – PER) is more akin to international long-haul, especially up front. And I agree with you; the Virgin Loft at LAX was a bit of a let-down. Does Branson take any interest in them? Australia/ USA/ UK/ Atlantic?